Commercial tree removal specialists providing hassle-free & friendly service from start to finish. Our qualified arborists have years of experience & the right tools to safely & efficiently remove any tree from any site. Waitakere Tree Services are passionate about what we do, which means getting the job done efficiently while leaving your site safe & tidy. 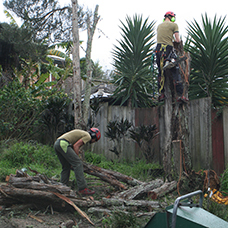 We have the capability to tackle big & small tree removals from hard-to-reach areas. Contact us today to enquire about our commercial tree removal service.